We are engaged in manufacturing a precision engineered range of Rotary Vacuum Dryer that is fabricated using quality raw material and tested to ensure that it is perfect. The granular wet feed material is free flowing and is made to shower frequently, in a cascade manner through hot air stream, when moisture gets transferred to the air. It progressively makes the product dry as it travels through the length of the dryer cylinder provided with suitable lifters. The humid air is exhausted via a dust collection system to trap any fines that escape with the exhaust air. Established in the year 2001, Process Units is engaged in manufacturing and supplying of solid & liquid separation equipment. 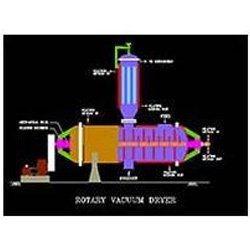 The range offered by us comprisesrotary vacuum drum filters, rotary vacuum dryers, industrial rotary vacuum dryer, agitated nutsche filters and fractionating columns. apart from these, we also manufacture heat exchangers, shelf dryers, screw conveyors, reaction vessels, and continuous fluid bed dryers. these are appreciated for their excellent performance, low maintenance and low amount of heat loss. Our products are manufactured using advanced machines and equipment. The products are tested to ensure that these are flawless and provide maximum output. The range can also be customized as per the requirements of the clients. Further, we also offer installation, inspection and commissioning service to the client’s. The company is engaged in manufacturing of various solid liquid separation, liquid separation, heat & mass transfer & vacuum dying equipment for the past 20 years. We have carved a special niche for ourselves in the industry under the able guidance of our owner Mr. Pradeep Mundle. His industry experience has enabled us to overcome all obstacles and garner a vast client base across the chemical and process industries.